Barcelona newcomer Arthur hopes to emulate the success of "role models" Xavi and Andres Iniesta after completing a €40million move from Gremio. The LaLiga champions fast-tracked their signing of the 21-year-old as a replacement for the outgoing Paulinho, who has returned to Guangzhou Evergrande. 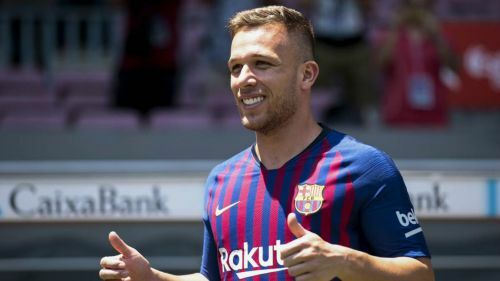 Arthur was initially expected to remain in Brazil on loan for a season, but will now inherit the midfield mantle from Iniesta. He has also been likened to another club great in Xavi and believes the lofty comparisons serve as inspiration rather than pressure. "It's fantastic to be compared to such great players," he told reporters at Thursday's presentation. "I don't hide my passion for those two players. I always admired them. "They're both similar players [to me], but I couldn't say which one I've got the most similar characteristics with. "I'm Arthur. I have my own career ahead of me. I have to show what I can do. People know what those two players did. "I can use them as role models for what they achieved at this club. I'll work to get as close to them as possible." Barca technical secretary Eric Abidal said it was an easy decision to usher through the addition of the Brazil youth international. "His style fits the club so well," he said. "And on a personal level it's important for him to have time to adapt, and to be here for pre-season and not in January as was originally planned."